As the Ministry of Aviation proceeds with plans to set up a national carrier that would operate international, regional and domestic services, it has emerged that Aero Contractors has been designated the nation's flag carrier. It was gathered that the decision to designate Aero Contractors as the national carrier was supposed to have been announced during the October 1 national broadcast to mark Nigeria's Independence by President Goodluck Jonathan, but it was deferred for another date. As a national carrier, Aero Contractors is expected to enjoy preferential rights or privileges accorded by the federal government for international operations. It would hold some lucrative routes in monopoly, negotiate commercial agreements, pools and bilateral agreements with foreign airlines, articulate manpower training for the sector and serve as diplomatic tool for Nigeria. Designating Aero Contractors as the national carrier would also allow the airline to codeshare with other international airlines, as this would improve Nigeria's ability to take advantage of Bilateral Air Service Agreement (BASA) it has in place with other countries. 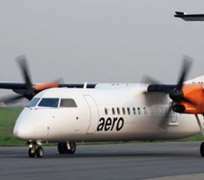 Aero Contractors, it was further gathered, was selected for the role because of the 60 per cent stake the Asset Management Corporation of Nigeria (AMCON), a federal government institution, already holds in the airline. Under the arrangement, the federal government shall retain 60 per cent through AMCON, while Legacy Holdings, a company owned by the Ibru family, will hold 40 per cent in the national carrier. The source further revealed that AMCON would only hold on to its 60 per cent shares in Aero Contractor for a limited period, after which they will be sold to the public at some future date. However, THISDAY gathered that there is also a plan to offload 10 per cent of the designated national carrier to a facilitator suspected to be a top government official in the aviation sector. The facilitator is said to have been responsible for facilitating the transaction. The facilitator, it was learnt, has set up a Special Purpose Vehicle (SPV) that would acquire 10 per cent of Aero Contractors three years from now. The source said under the deal, the facilitator would be required to ensure that the airport is modernised and a hub is created to enhance air traffic for the West African region as the conditions precedent for the acquisition of the 10 per cent in three years time. Although another source said the facilitator is a European low cost airline, it is believed that the low cost carrier is being used as a front for the government official. Presently, Nigerian airlines do not airlift up to 10 per cent of the estimated six million passengers who travel out of the country annually. Also, with the failure of domestic airlines to play a significant role, international carriers export huge resources from the country by way of earnings made from ticketing and remuneration for expatriate personnel.